Enless Soft - Joomla! 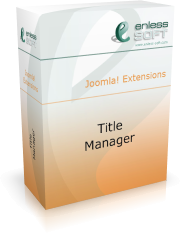 Extensions - Title Manager - News - Title Manager now supports Joomla 1.6! Enless Soft Products Joomla! Extensions Title Manager News Title Manager now supports Joomla 1.6! We are happy to inform you that Title Manager now supports Joomla 1.6! The new version of Title Manager is 1.6, reflecting the Joomla version. If you are an existing customer, just log in to your account and head to the download section of Title Manager. You will find both 1.5 and 1.6 installation packages there. If you are a new customer, proceed to the online purchase page. Since Title Manager is a mature product now, there is not much to be changed. No bugs are currently known. Anyway, there were some changes due to the new model of Joomla 1.6. As you probably know, sections do not exist anymore. They were replaced by hierarchical categories. This is why the built-in “Current section” title item, which was used to add to the title the name current section, was removed. It was replaced by a new item, called “Current category path”. It can be used to display the current category and all its parents in the title.